A Hint of Eternity: Portraits from the Howard D. Beach Collection will open at the Buffalo History Museum on Wednesday, December 19, with a free reception from 5:30 to 8:00 p.m. Under the guidance of Buffalo State museum studies master of arts program faculty Cynthia Conides and Noelle Wiedemer, graduate students Ashtin Ashbrook, Ashley Carney, Melissa Fanton, Leah Glenn, and Anna Wachtel researched the history and genealogy of Beach’s portraits, provided courtesy of the Giallombardo family and the Buffalo History Museum. Beach, whose career spanned from the 1880s to the 1950s, honed his craft as a prolific portrait photographer in Buffalo. The National Photographers Association awarded him the title of master photographer for his excellence in both portrait photography and experimentation in the profession. The images selected for this exhibit illustrate the national reach of Beach’s clientele. Included in the exhibit are historical portraits from Buffalo’s 1901 Pan-American Indian Congress, the hauntingly detailed death mask of President William McKinley, and the exquisite portfolios of famed Broadway actress Katharine Cornell. The mythologies of Beach’s patrons have endured “out beyond the trodden path” of their era. As Beach had hoped, their narratives, images, and work have outlived them. Buffalo State’s museum studies master of arts program is a nationally competitive program that trains museum professionals who are distinguished by their versatility and creative problem-solving ability. The program uses a multidisciplinary approach, including theoretical and practical instruction and experience. It prepares innovators who serve the broad and changing needs of both collections and communities in the twenty-first century. A Hint of Eternity: Portraits from the Howard D. Beach Collection runs through June 2019 at the museum, located at 1 Museum Court in Buffalo. For more information, call the museum at (716) 873-9644. 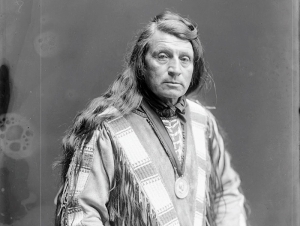 Image: Chief Red Shirt, Oglala Sioux (1845–1925), 1901 Pan-American Exposition Indian Congress. Photographer: Howard D. Beach. Courtesy of the Giallombardo family.